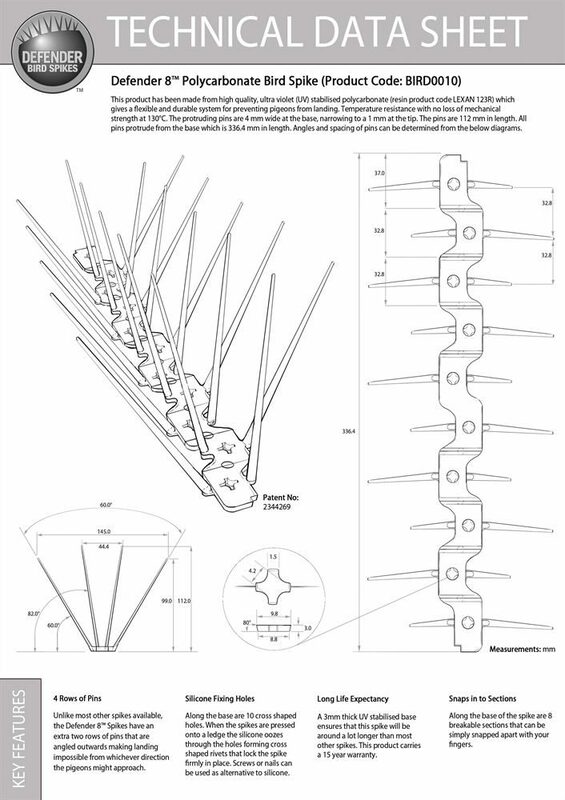 All our pigeon spikes are made by us, Jones and Son in Devon. Please feel free to visit our warehouse, chat with our friendly advisers and see how our spikes are made. All the Defender® Bird and Pigeon Spikes are a humane method of bird control. The bird spikes make it uncomfortable for birds or pigeons to land, without injuring them. They will then move on to other roosting or nesting sites. Defender® 8 Wide Plastic Pigeon Spikes are easy and simple to install. We recommend using Defender® Bird Spike Fixing Silicone to attach the strips to the ledge. However, screws, nails or cable ties can be used as an alternative. 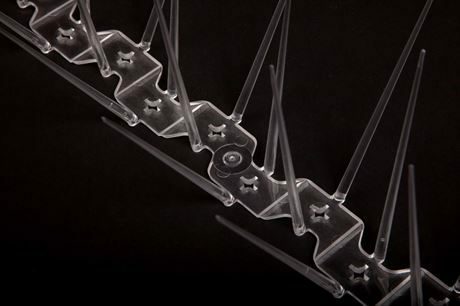 Please see our Defender® 8 Wide Plastic Pigeon Spikes - Installation Guide It is important to check the suitability of surfaces for use with Defender® Silicone. For more information, please visit the product page Defender® Fixing Silicone Adhesive Glue. Along the base are 10 cross-shaped holes. When the pigeon spikes are pressed onto a ledge, the silicone oozes through the holes forming cross-shaped rivets that lock the spike firmly in place. 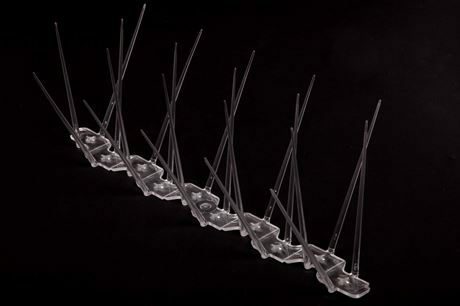 The Defender® 8 Wide Plastic Pigeon Spike is made from super-tough Durolon UV stabilised polycarbonate. This ensures the spikes suffer no degradation due to the adverse effects of extreme weather. They do not yellow or become brittle and can withstand low and high temperatures. This bird control product comes with a 15-Year Warranty. 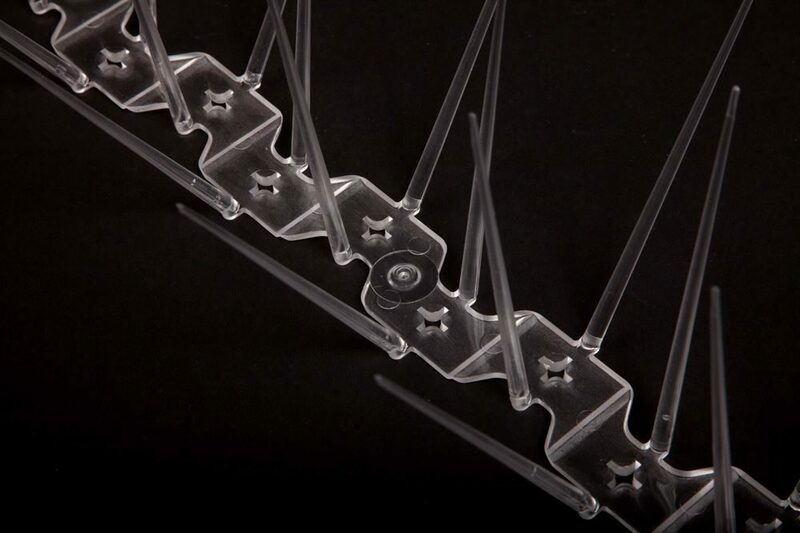 Along the base of the plastic bird spike are breakable sections that can simply be snapped apart with your fingers. This means the anti-roosting pigeon spike can easily be adjusted to fit the length of your ledge perfectly, making installation quick and easy as you require no extra tools. 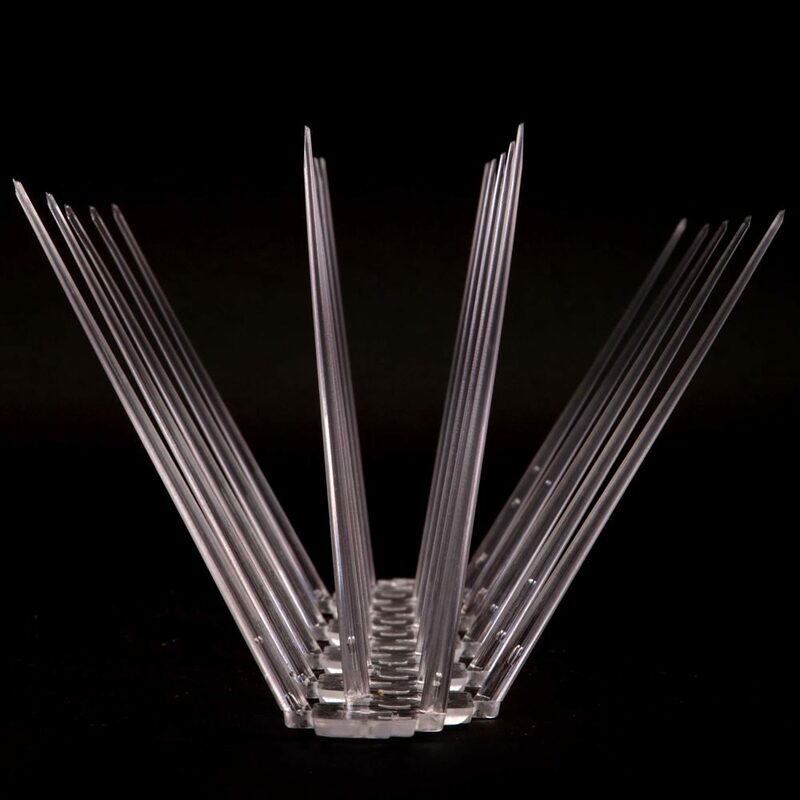 Our Defender® 8 Wide Plastic Pigeon Spikes are made from UV stabilised polycarbonate, ensuring that this spike will not become brittle in direct sunlight or adverse weather conditions. It comes with a Product Warranty of 15 years for extra peace of mind and will protect your property for years to come. Many other lower quality products on the market will become brittle after only a few months. If the bird spikes snap due to poor quality, the persistent pigeon will force its way back onto the ledge. All Defender® Bird and Pigeon Spikes are made in the UK using only the highest quality materials. Jones and Son Pest Control Supplies Ltd is a family run business which prides itself on the manufacture of quality steel bird spikes and plastic pigeon spikes that will keep birds off your property, business or home. Defender® 8 Wide Plastic Pigeon Spikes are easy and quick to install. No professional pest control equipment is required. For a Technical Data sheet for the Defender® 8 Wide Plastic Pigeon Spike, please click on the image on the right to view a PDF which you can print for reference if required. Our Defender® 8 Wide Plastic Pigeon Spikes have transformed the lives of thousands of people trying to get rid of pigeons from their properties. Read Wide Plastic Pigeon Spike Reviews. If you have a "How to get rid of pigeons" question, please contact us and we will get back to you to start to help you solve your pigeon problem. Please note: For every 24 strips (or part there of) that you order, we will automatically add one tube of Defender® Fixing Adhesive to your basket. Only our adhesive is recommended as others may not stick to the base.